In my experience, many people who get involved in insulation simply want to grab a box of insulation off the truck, rip it open and start installing it. Few people actually spend much time thinking about the design of the system and the appropriateness of the insulation for the service in which it’s going to be installed. And, it is rarer to find any forethought given to maintenance of the insulation at the time the material is selected and installed. What most of us don’t realize is there’s a little bit of science that goes into selecting the right insulation material and installing it properly. It means that you have to be part meteorologist, part engineer and part scientist to understand the important factors in selecting the right material for the job. You don’t have to be an expert, but you have to understand some very basic principles about thermodynamics, physics, weather and the properties of insulation materials and how they’re used in various services and environments. Understanding these basic elements ensure an appropriate system is selected and installed for long life and lowest total cost of ownership. Insulation science begins with an understanding of fundamental thermodynamics. It’s a word that sounds scary but it really isn’t. Thermodynamics answers some key questions: what is heat; how do we measure it; how does it flow; and in the presence of heat energy, how can we determine the effectiveness of any material resisting the flow. We talk about insulation in terms of heat, hot and cold systems, but in reality we’re talking about thermal energy. Heat is a form of energy that is the result of molecular motion. Everything contains thermal energy in varying amounts. Thermal energy subscribes to the laws of physics and like other forms of energy, thermal energy is always seeking equilibrium. That simply means when one object is warmer than another, heat will always try to flow from the object with more heat energy to the object with less, until they have the same amount-equilibrium. Heat or thermal energy is measured in Btu’s, which stand for British Thermal Units. One Btu is the amount of energy needed to raise the temperature of one pound of water by one degree Fahrenheit. It’s approximately the amount of energy given off when you burn a match. The basic premise of insulation is that it’s a material that serves as a barrier or retarder to the flow of heat energy. For selecting insulation, you have to know how heat flows and how insulation retards that flow. The flow of heat from one object to another is called heat transfer. There are three fundamental methods of heat transfer that must be considered when designing insulation: conduction, convection and radiation. Conduction occurs when two objects are in direct contact with each other. The objects transfer heat by interaction of their molecules. By contact with another object, energy is transferred until it establishes equilibrium between the two objects. For example, if you heat one end of a piece of metal you may not be able to hold on to the other end as it heats up by conduction. This is why we have oven mitts in the kitchen. Convection is the transfer of heat energy by movement of a gas or fluid, such as air or liquid. For example, when air is heated it expands, becomes less dense and moves upward. Cooler, denser air moves in a downward direction. This is why the second floor of a house or building is usually warmer. Convection is an issue when we have air flow around an insulation system. Radiation occurs when heat energy passes from one object to another that aren’t in contact without warming the space in between. The biggest source of radiation energy is the sun. Thermal energy from the sun passes through millions of miles of outer space without warming that space until it strikes an object, such as the earth. Radiant heat can be reflected by a white or light colored surface or absorbed through a dark surface significantly raising the temperature. This is why we buy so many white cars in Texas, to keep the car cooler in the summer. We measure the ability of an object to reflect or radiate energy by comparing it to a black body at the same temperature. We call this emissivity. Climate and weather factors boil down to water in its three forms, solid (ice), liquid and vapor, ambient temperature of the surrounding air, air movement or wind and radiant heat loading. To get an idea of why it’s important to factor weather and climate when selecting insulation, I’ll share a few stories. Several years ago, I worked on a project at a Norwegian refinery. A typical refinery has a major shutdown and turnaround every three or four years, depending on their need to maintain their equipment. This particular refinery went through its scheduled turnaround in 1986. When they tried to restart the process, they weren’t able to do so because they had a tremendous amount of corrosion of piping and vessels underneath the insulation. The corrosion was caused by moisture under or in the insulation. On the west coast of Norway, it typically rains 210 days a year (30-year average). The first year I was there it rained 310 days; essentially there was precipitation during part of every day. The west coast of Norway is warmed by the Gulf Stream as it swings around Ireland and Great Britain, turns east and then hits Norway. Along the coast it doesn’t get as cold as many might think, even though it’s near the Arctic Circle. The climate is Seattle-like, with mostly rain and some snow. 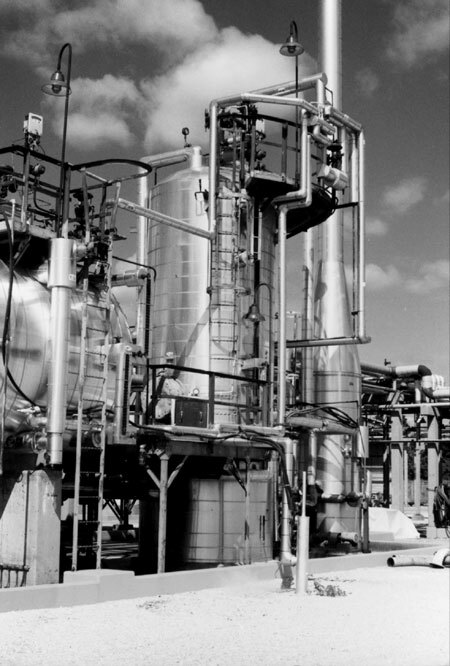 The refinery used a fibrous pipe insulation, which was manufactured with a water repellant added to the binder that holds the fibers together. I have seen a block of the insulation float in water. This would seem a good system for a wet environment. So, what went wrong? Because we are dealing with a large processing plant with many insulated surfaces in different services, there is no one answer. Let’s consider some of the possible suspects. New insulation was stored outside unprotected and installed in the rain. The belief was even if the insulation got wet, which it shouldn’t because of the repellant, the system would dry out once it got above the boiling point of water. Most of the time, this happens. The jacketing over the typical hot system insulation isn’t designed to be a vapor retarder. Therefore, moisture vapor can come and go. In fact, various tests show that the time for the moisture to escape can be relatively quick depending on the amount of moisture present, the surface temperature, the tightness of the system, the orientation of the insulated surface and the ambient temperature and humidity. A system continuously above the boiling point of water can dry out as quick as 32 hours or, on a tight system, take several months to never. Also, the jacketing was placed over the insulation in rainy weather. While the insulation itself may have been repelling water, moisture was trapped in the system. Some was trapped under the insulation and some under the jacketing. As the insulated surface heats up above the boiling point of water, the trapped moisture vaporizes and the vapors move towards the cooler jacketing where the vapor pressure is lower. The water repellant property of the insulation could trap the moisture under the insulation and force the vapor to seek joints and other areas of "less resistance" to escape as the heat increases. The maintenance manager at chemical plant in Wilmington, N.C., took calcium silicate, soaked it in water for 24 hours, installed 6 feet of the wet insulation on a hot system, capped the ends and covered it tightly with aluminum jacketing. A year later he came back, removed the jacketing and found the insulation still wet. Another factor to consider was that not all insulated surfaces operated above the boiling point of water. Steam condensate returns are insulated primarily to keep them from freezing and for personal protection. Moisture under this insulation never reaches the boiling point; therefore, gravity and an exit point are the only way out. The most extensive corrosion at the refinery occurred on these types of systems. In addition, some of the units were down for extended periods, giving any moisture present a prolonged opportunity to create a corrosion cell. This was aggravated by poorly maintained insulation covering that had been breached by mechanical damage. These openings allowed additional moisture in even while the systems were running. Regardless of how quickly the insulation dries out, moisture was against the insulated steel piping, equipment and vessels while the systems were cold. Water in all of its form is a major enemy. In the end, the Norwegian refinery was down 42 extra days, and spent in the neighborhood of $20 million to $30 million dollars on overtime, repairing corroded pipes and putting the plant back in a "like new" condition. Add to that the cost of lost production. Installing the right insulation properly and maintaining it is cheap! A large chemical company in the Houston area had deep corrugated galvanized jacketing on two 12-foot foot diameter by 90-feet bullet tanks. The deep corrugation on the jacketing ran parallel to the ground, horizontally. Rain falling on the jacketing would run along the corrugation channels until it found an opening to pour through. Over time, as punctures in and deterioration of the jacketing occurred, even more water entered the insulation. There were inspection ports in the belly of the tank. When we pulled the rubber inspections plugs out, water would drain out. Once again, deep corrugation might give strength to a jacketing for a vertical tank and be a good selection for a vertical tank, but on a horizontal tank, the retaining and channeling of water is not a good design. In another test the maintenance manager at the North Carolina chemical plant took a horizontal section of line insulated with a wicking insulation. Then he took a 10-penny nail, drove a hole in the top of the insulation jacketing and, after a heavy rain, opened it up and found that water migrated 15 feet to 25 feet on either side of the 10-penny nail hole. This shows that it doesn’t take a very large opening in insulation for moisture to get in. Condensation and process control are the two main reasons for insulating low temperature surfaces. When equipment or piping operates at temperatures below the ambient air temperature, moisture in the air will condense or freeze on the cold surface or, within, or on the insulation. The moisture vapor in the air outside of the insulation on a cold system is at a higher pressure than the moisture vapor inside the insulation. Following our rule from physics that all forces seek equilibrium, the higher-pressure moisture laden air from outside wants to flow through or around the insulation to reach the lower vapor pressure against the cold surface. Cold systems require special attention because one must design for protection against condensation and consider the affect of moisture vapor transmission. Water vapor transmission (WVTR) is the rate of water vapor diffusion through a material. The lower the WVTR, the better the vapor retarder. A chemical plant in Victoria, Texas, had a 40-foot diameter sphere insulated with cellular glass and a vapor retarder. From the outside, for the most part, the insulation looked good. During our inspection we were attracted to the swollen belly of the sphere where we cut a hole in the insulation jacketing. When this was done, about 200 to 300 gallons of water came pouring out, and it continued to drain for several days. Why did this happen? There are two possibilities-breach of the jacketing/vapor retarder integrity somewhere above allowing direct entry of moisture and/or somewhere in the system, condensation occurred on the surface under the insulation. People-dropping a tool, walking on the insulation or striking the insulation with scaffolding, piping or other objects-most frequently cause breaches. Occasionally breaches are caused by thermal expansion and contraction, improper installation or wearing out due to age. Condensation can occur under the insulation for numerous reasons, including breach of the vapor retarder or inadequate thickness. More often, it’s caused by inadequate attention to penetrations. By penetrations, I mean, where a nozzle or structural support member passes through the insulation to connect to the vessel. First, every penetration must be properly sealed to prevent moisture vapor transmission between the object and the insulation. Second, by conduction and trying to reach equilibrium, penetrations are frequently colder than the ambient air temperature, and condensation occurs on the object introducing moisture into the system. Insulation must extend along penetrations far enough to prevent this from occurring. Once moisture is in or under insulation, gravity causes the moisture to run down to the lowest point. In this case, because the vapor retarder had good integrity down there, it couldn’t let the moisture out. The only clue that there was a problem was the sagging of the insulation under the weight of the water. We calculated that the water weighed approximately 1,800 pounds (or nearly one ton!). This demonstrates that keeping moisture out and condensation from occurring should be a top priority for all cold systems: proper design and installation; good seals; and timely maintenance, are all very critical factors. It’s one thing when we go into a new construction project and we have no experience with the vessel or pipe that we’re insulating, but it’s another thing to go in and do maintenance. What we teach in the National Insulation Association’s (NIA) National Insulation Training Program about selecting materials for either situation is this: don’t pull out an old specification, dust it off and use it again. Go out, look at the system and make sure that the conditions have not changed. What frequently happens in maintenance (probably 95 percent of the time) is that insulation is repaired with like and kind material. There’s never a root cause of failure analysis done, and so people who have these 12 foot diameter, 90 foot long tanks rip the stuff off, say that this is the kind of jacketing that was on there before, and go put new jacketing on. In essence, they’re putting themselves right back into the same problem. When inspecting industrial facilities, I look at changes in the boiler steam load that occur as the weather changes. Most plants know what their steam demands are. Steam demand in a chemical plant or refinery is fairly uniform. They basically know the factors that influence increased or decreased demand. They have good historical data. What you can observe is what happens to the steam load when it rains hard. If the steam load goes up suddenly, which it will, that probably represents a number of bare surfaces getting wet and properly insulated and maintained systems cooling down. The rest of it is probably attributable to insulation getting wet. The most important thing in looking at the steam load is how fast the plant recovers. If you notice a rapid recovery once the rain stops, then you have an indication that predominantly bare and properly insulated surfaces got wet. When the rain stopped, they warmed back up and the steam load went down. But if it takes a prolonged period of time to get back down to normal steam loads-say they regain 20 to 30 percent of the steam that they lost in the first hour and then the next 70 percent takes two days to get back to where they were-chances are they have insulation that’s getting wet. So, looking at steam load can tell you that moisture’s getting into an insulation system if you observe a slow recovery after rain or cold weather. This occurs mostly after rain, because of moisture getting in the insulation. Cold weather will only tell you that there are exposed pipes that are getting cooled off by the weather. It’s important to remember that changes in steam demand are just an indicator, and nothing replaces a through visual inspection by a properly trained inspector. Those who come from the industrial side of the world, whether it be onshore or offshore, refineries, chemical plants or other industries, know that when operating an industrial system, mechanical forces are introduced into them, either by the flow of the process or by the equipment that moves the product, such as pumps. Those forces create vibrations in the system. Vibration is a type of mechanical energy that can destroy insulation systems. Understanding the type of vibration and its severity could have an impact on the materials that you select. There have been situations where insulation materials have eroded away from vibration to the point where the metal jacketing was sitting on the top of the pipe, and all the insulation in between was worn out because of the constant movement of the pipe, similar to sandpaper going back and forth. The pipe just kept rubbing away until it wore down to the metal jacketing and bands. So, there are mechanical forces in the science that transfer energy, or that affect insulation systems, and it’s important to understand those forces. In places such as Texas, when we put in insulation systems, we have to consider what’s the worst type of storm to which it can be exposed. In this setting, it would probably be a hurricane. In a hurricane, sustained winds can be as strong as 150 to 160 miles per hour. So, designing proper securement is a very important part of a good insulation system. In parts of the world where hurricanes and cyclones are common, that needs to be a consideration. At a chemical plant, in La Porte Texas (near Houston), after a tropical storm, insulation was ripped off some of the columns because they weren’t properly secured. After hurricanes, I have seen pieces of insulation lying on interstate highways. So those forces need to be properly addressed. Ultraviolet and sun radiation are also issues for insulation, and properly installed and maintained cold systems can prevent the growth of ice, mold and mildew. Additionally, we have to understand the fire resistance properties of different insulations. The bottom line is that any insulation that’s been manufactured by any of the NIA members is fantastic stuff when it’s properly specified, installed and maintained. It’s essential that we understand the science of insulation so we can pick the right material for the right situation, and then we must treat it with respect when we install it. We have to follow up and to continue to monitor it over time and fix damage early instead of later. It’s amazing to me that people often treat insulation like that old oil filter commercial-the one that says "you can pay me now or you can pay me later." It’s a bad choice to pay later because you’ll always pay a whole lot more. Understanding the science of insulation will save you lots of money. At industrial facilities, insulation needs to be properly installed, secured and maintained to withstand factors such as elements, mechanical energy and extreme weather conditions. 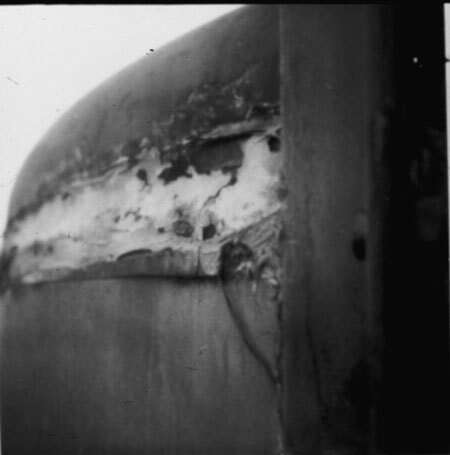 Indications of weather barrier failure on an insulated tank head.